Editor’s Note: iPhone and iPod touch users need never want for shopping list applications. The App Store offers some two dozen choices when it comes to apps that help you keep a list and check prices of all the items you need on your next food run. 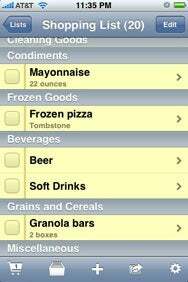 A while back, senior editor Rob Griffiths reviewed a trio of grocery list apps after compiling a spreadsheet of some 22 shopping helpers. We’re circling back and evaluating some of the other grocery list keepers available for download from the App Store. 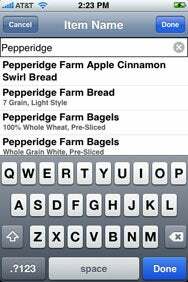 Narrowing the Field: As you type a search item in Grocery iQ, the app winnows down the list of search results to match what you’re looking for—right down to the specific brand and flavor. If ever there was such a thing as a smart list for shoppers, Grocery iQ fits the bill. The application from Free State Labs contains a database of more than 130,000 items found at supermarkets across the country, all of which can be added to your new smart grocery list. As you type, Grocery iQ presents real-time results to help you find the item you’re looking for in seconds. Say I’m looking for a particular flavor of Breyer’s ice cream; as I type in “Breyer’s,” Grocery iQ will narrow the search results to all flavors of ice cream and frozen yogurt that Breyer’s makes. As soon as I begin adding “chocolate chip” to my query, Grocery iQ narrows my search so that I can find the right flavor of ice cream right away. After you find the item you’re looking for, Grocery iQ gives you control over every item on your shopping list. Simply add the item to your shopping list right away or fill out the additional fields for the specific size and quantity of the item you need along with any additional notes (“buy one, get one free” or “have a coupon”) that you need to remember. If you’re like me, you often buy the same items again and again each time you visit the store. Grocery iQ lets you easily bookmark these favorite items by enabling you to tag them as favorites the first time you purchase them. Favorite items are then added to each subsequent shopping list automatically so that you never have to worry about them. If you want to easily find an item you purchased previously, you can use Grocery iQ’s history page to scroll through past purchases quickly. One of Grocery iQ’s key features is that it organizes items by category. Each category in Grocery iQ is comparable to an aisle in your local store. By default, the categories are listed alphabetically but power users will probably want to reorganize the categories to match the layout of the aisles at their local store. If you prefer an actual list in your hand instead of an iPhone, Grocery iQ includes an option to e-mail the list for printing. Grocery iQ creates a simple text list which you can send to anyone—especially useful if someone else in the household is doing the shopping. Despite being pretty organized, I have always struggled with my weekly grocery list. My inability to stick to one method (write it all out at once or keep a running tab) ultimately results in me wandering around the store, muttering to myself as I struggle to decipher notes I’ve scribbled in the margin or determine which items I’ve already crossed out. Prepared List: Shopper comes with a number of pre-populated items which you can select to create a grocery list. Enter Shopper, a refreshingly simple-to-use app from MidCentury Software. Shopper comes pre-populated with a number of grocery items to pick from with categories in which you can place those items. Shopper’s list of items is not exhaustive by any means, but adding your own is easy and intuitive—if the item you’re searching for isn’t in the list, just tap Create to the right of the search bar. After creating or selecting your item you can then specify a quantity, price and category, as well as input a note. The ability to create new categories and rearrange existing ones so that your shopping list can be organized according to the layout of your grocery store make the app especially valuable. Other Shopper highlights include being able to upload a picture for each item, e-mail your shopping list, specify currency and calculate sales tax. Both apps are compatible with any iPhone or iPod touch running the iPhone 2.x software update. This article has been updated to correctly state that Shopper allows you to create new categories; an earlier version of this review misreported that capability. The correction did not impact Shopper’s mouse rating.